I'd been testing my DogCam Bullet HD on the handlebars of my bike. Yesterday I fixed the camera to my cycling helmet and rode to the Bolton Arena. My speed awareness course was held there today, starting at 8.00 am. By coincidence the Bolton Arena was designed by me in 1996. This is only the second time I've been inside the building since it was completed in 2001 (the first was when I applied to work there as a cleaner in 2005). The bullet cam is fixed to a helmet with sticky tape, adjustable Velco, and two elastic loops. With a little trial and error it can be made to point in roughly the right direction. When fitted to the bars the mic picks up a rumbling noise which I guessed might be road noise passing through the bicycle's frame, and a clicking sound from the chain. In fact these same noises are picked up on a helmet and the rumbling is wind I assume. Head movement looking round at junctions or before overtaking can cause the picture to disappear for a second or two, and the cam doesn't like direct sunlight. Otherwise the image is acceptable but I think I prefer the cam on the handlebars. 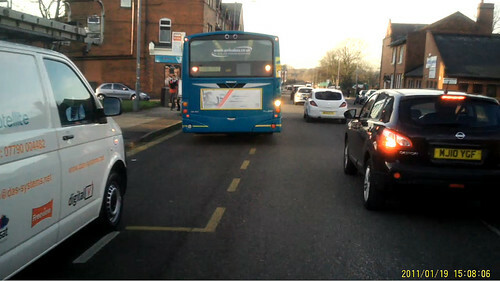 This particular video illustrates an annoyance typical of cycling along bus routes: bus leapfrog. The bus goes past, stops at the next bus stop, you overtake, then the bus goes past again, and you come up behind it again at the next bus stop. Sometimes it's best to wait for it to move off and sometimes it's best to get past. Either way you always end up behind the bus. On the speed awareness course I learnt how to distinguish between a 30 mph and a 40 mph speed limit and that the national speed limit is 60 mph, not 70 mph. This will not affect my cycling. I also learnt how driving is supposed to be controlled by different types of speed limit signs and what an upside down triangle sign means. As a sign-hater I found this part disconcerting. I think motorists should be helped to think for themselves and to take more personal responsibility for their actions. Note: part way through the video the sound goes off and becomes sound from somewhere else, then reverts back to the right sound a little later. I've no idea what might have caused this, unless it was Avidemux, the software used to edit the video. I'm still a learner. Posted by Patrick on January 20th, 2011. The helmet-mounted camera gives a different perspective than handlebar-mounted. It puts you more in the mind of the rider (right-left-right when crossing, over the sholder when passing, etc.). Also, it allows more artistic flexibility for panning across the landscape, etc. However the image is definitely more jerky than the handlebar mount. I think you need both. Questions: What is the storage capacity? What is the battery life? Can it take stills as well as video? Can it take a timed sequence of photos (e.g. one every minute)? What are the mechanics of downloading to a PC? Bolton Arena looks like a serious project, Patrick. You must have had conflicting feelings returning to it as a private citizen after having had "ownership" during its design. Was it a successful project in your estimation, and by what criteria? I take a sceptical view of a lot of modern architecture, particularly when the interests of private developers are involved. In Ottawa there is much debate over plans to develop what is today an particularly ugly patch of concrete in the middle of a prime old neighbourhood. The proposed plans appear to be better suited to a suburb than a pedestrian, residential community. By the way, based on the photos, Bolton Arena appears to be a lovely piece of work. The storage is a removable MicroSD card up to 32GB. Mine is 8GB and will store about 3 hours of HD video. The battery life is 1.5 to 2 hours. This is non-replaceable so the cam needs plugging into a PC via the supplied USB cable to recharge it (takes about an hour). A mains recharger is available as an extra. It can't take stills as such, nor a timed sequence, although stills can be created when editing the video. The 'unique selling point' is the camera's very small size and there is only one control: on or off. Video files are downloaded to a PC via the USB cable. Avidemux is the (free) video editing software I've used so far. At the very least you need something that will cut unwanted sections off the video. This thing is a cycling fun toy really, and cheap. Thanks for your comment on the Bolton Arena. As far as I know it's a big success. My involvement ended during 1999, even before construction began. I created the architectural concept and developed it up to sketch design stage, then everything was handed over to others – a large team including the firm of architects who now seem to claim sole credit for it. I don't mind much, but when the opportunity arises I make a point of correcting the record. By success I mean the Bolton Arena has survived commercially and it's something the town is proud of. It is by no means the white elephant lottery funded projects sometimes are. Amir Khan (from Bolton) has fought there and it is a nice building. Lots going on there and that gives me some satisfaction. Generally though, I pass things I've designed without a second thought. The quality of the footage seems pretty impressive for such a tiny and simple to use camera. Definitely a toy worth considering! Your video highlights the annoyances of urban cycling – leap frogging buses, cars edging out too far and cycle lanes that constantly cross from one side of the road to the other. ... the annoyances of urban cycling ... cycle lanes that constantly cross from one side of the road to the other. You're right there, and piecemeal cycle lanes that are not continuous. I've never understood the logic of this. Either a road needs a cycle lane or it doesn't – I think that's how it should be anyway. Often, when it comes to the tricky bit where you might actually benefit from one – at junctions and roundabouts for example – the lane is gone, or as you say, you're on the footpath, but even then the cycle path can suddenly stop (what you are supposed to do then I have no idea).